Dr. Cyndi Danner Kuhn is using my ebook this semester, “Playing with Media: simple ideas for powerful sharing,” as her course textbook in DED 318 at Kansas State University. DED 318 is a required technology education course for pre-service teachers, and it’s great to see how Cyndi continues to iterate and evolve the focus and projects in this course for students based on changes in edtech. Recently her students responded to the question, “Why is it important to play with media?” in the private Edmodo group she’s using in her course. I created a Wordle word cloud from their responses, to identify some patterns which it exposes in their collective thinking about this question. 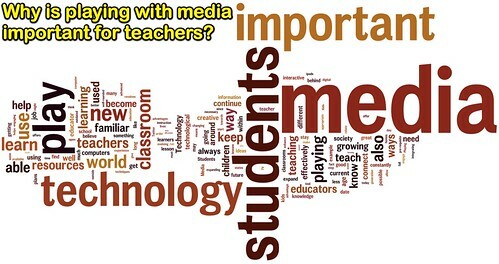 What else do you think is missing as a “major idea” in this Wordle cloud summary of why it’s important to play with media? Is LITERACY in the word cloud? It is an old but critical concept that media in all its evolving forms requires us to re-define: digital literacy, visual literacy, social literacy…… How has the definition of LITERACY changed since as a student you first learned to read (or since you transitioned from “learning to read” to “reading to learn”)? How does your definition of LITERACY relate to reading across content areas? to Common Core? to strategies you will use as a learner, teacher, facilitator, mentor and/or coach?